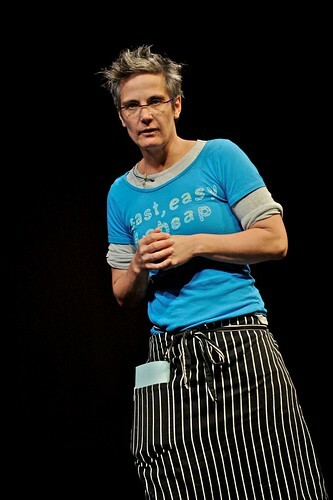 A Conversation with Monica Pope: Woman, Chef, Entrepreneur … Inspiration. We’ve been talking with some entrepreneurs to get their story on owning their own business and advice for youth who will be opening their first business, a lemonade stand, across the nation this year. Our first talk is with Monica Pope. Lemonade Day [LD]: Did you have a lemonade stand as a child? Monica Pope [MP]: No, but I began young [as an entrepreneur]. I went around the neighborhood collecting recycling on my bike – even at a young age I was always eco-conscious. I also sold Bubble Yum in school [which was illegal but a great moneymaker]. LD: What was your first business and what inspired you to open it? MP: It was April 1992 – The Touqe. I decided as a teenager that I was going to be a chef and have my own restaurant. I worked with my grandma to learn family food traditions. I’m currently writing a memoir. I want it to connect with family; the food system of the 70s – the way we ate in the 70s, the way we didn’t eat … and what was wrong – we need to get back to the dinner table. LD: If you could give one piece of advice about starting a business to our young entrepreneurs setting up lemonade stands, what would it be? MP: For me, it never was about a restaurant, it’s not the ordinary economy, but a Transformation Economy. Be unique, be different, without trying to be unusual; I’m very picky when I go into a another restaurant –where’s the feeling; where’s the person behind the restaurant? At farmer’s markets – it’s $15 for a table, I say ‘good luck making $100 profit in one day.’ Farmers are there to either make money or conveying something else – where they grew it … why they grew it. We’re craving real people doing real handmade things. LD: Youth who participate in Lemonade Day must have a “caring adult” participate with them. How have your parents and family helped and supported you as an entrepreneur? MP: My father was the first lawyer at my first restaurant. My family was my investors. I started my first restaurants with no money. There was an agreement in my family. My mom took care of girls, my dad the boys. Mom prides herself that her daughters were successful – my sister created the internship program at the David Letterman show and then became a producer in a male dominated industry. I went to the top 5 restaurants at any city. Mom was creative and gave us freedom – go where you want to go, do what you want to do. I was the odd kid who went to college and still knew she wanted to open a restaurant. My parents were there to listen: to hear sad stories and success stories; to support me. And, of course, grandmother let me come work with her to learn family food. LD: What do you enjoy about owning your own business? My advice: Go for it. No matter how crazy it sounds. LD: Name one scary moment you encountered about starting or owning your business. MP: The longer I go, the scarier it gets. I look back and wonder how it [the restaurant] stayed up. I have to pay for insurance. We’ve been underwater, had no electricity. There’s not a lot of cushion in this business. 20 yrs ago, I had nothing to lose and it was terribly hard. Now I have a family and people who’ve been with me for 20 yrs; staff, customers – if I don’t make it now, I lose all that – it’s not the money, it’s all that wonderful stuff. I just cried yesterday. I’m doing something really hard and trying to figure out how to get money for something big in the next few months. It’s because it’s scary, that’s what I’m supposed to do. It’s crazy. I’ve met too many people who did what they were ‘supposed’ to do – what was planned – and my parents let me make my own decisions. It was really hard. For a really long time. I had to find those people to be with me for 20 years. I had to be the boss that they wanted to be with for 20 years. I created a place I wanted to wake up to everyday. If you’re afraid to do something, that’s what you’re supposed to do. ABOUT MONICA POPE Inspired to bake and cook by her Czech grandmother, Monica knew that after she received her Bachelor’s Degree with a major in English that she would cook in restaurants and eventually open her own. She began her career at the age of eighteen for Cafe Annie in Houston. She later left Houston for Europe where she spent the next three years working in restaurants in Greece and London. In 1990, she earned her Chef’s title from Prue Leith’s School of Food & Wine. She returned to the United States, working first in several innovative San Francisco restaurants, (Bix, Eddie Jacks) then coming back to Houston to work in Marion Tindall’s Bistro Cuisine and Tony Vallone’s La Griglia. In 1992, Monica opened The Quilted Toque, where she made an impact on the Houston food scene. She opened her second restaurant, Boulevard Bistrot in 1994 where she was named one of Food & Wine Magazine’s Top 10 Best New Chefs. After 10 years at her Museum District institution, Boulevard Bistrot, the restaurant’s lease was up; Monica decided to break out of the bistro box and create a new concept in an up-and-coming part of Houston, South Midtown. Inspired by the location–an industrial red-brick building on 10,000 square feet of land–Monica has again envisioned and made real an incredible place with simple, good food using as many local and regional ingredients as possible. Monica is one of the founders of the Midtown Farmers Market a weekly market located at t’afia, that brings the community together on the cornerstone of food with offerings from local farmers, craftspeople, and chefs making artisnal, handcrafted breads, chocolates, pastries and prepared foods.